(CBS News) Ann Romney, the wife of Republican presidential candidate Mitt Romney, is at the center of the political universe right now. She wasn't always. Her decision to stick up for her life choices and play offense in the back and forth with a supporter of the Obama administration over women voters is just the latest in a long-evolving public image. 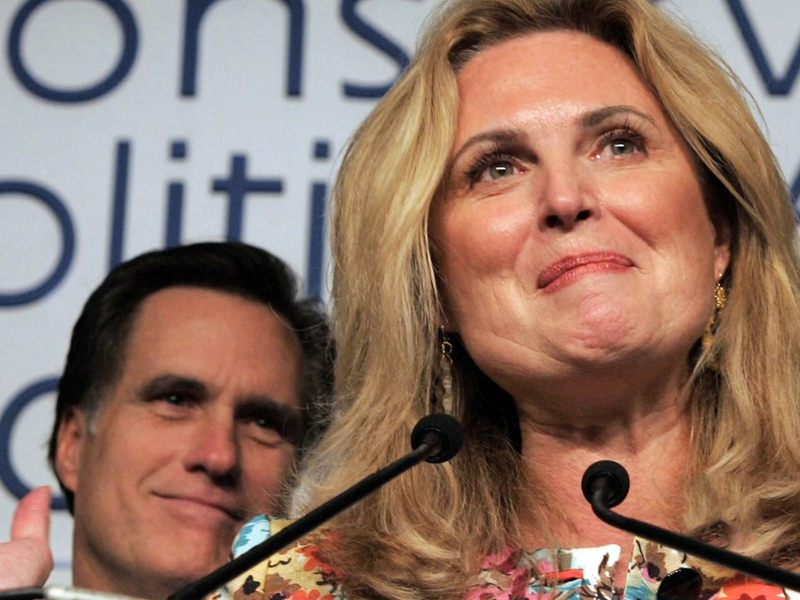 Ann Romney has evolved from a likeable sidekick to a serious political player. Remarking that "life isn't always a bowl of cherries," Romney described her bouts with cancer and Multiple Sclerosis. The latter disease had stricken her so quickly and severely that she told the crowd even lifting an envelope was incredibly painful - she could not open the mail. Fearing she might be wheelchair bound and unable to tend to their household, Ann said that Mitt told her "'I don't care - I can eat toast and cereal for the rest of my life'" and expounded, "'I'm not going to leave your side, I'm not going to abandon you.'" The Granite State patrons swooned as she buttoned up her remarks by saying how grueling trail life could be on their family - but how worthwhile. "It's so hard on the families - you don't appreciate that - how difficult it might be on the families," she said. "It's very difficult to watch your husband go through this process. I'm very protective of him, and yet I'm very confident in his abilities. So it's worth it. The process is wonderful." It wouldn't be long before Mrs. Romney's message was more widely heard. She hopped on bus tours on the trail in Iowa and New Hampshire in December, grinning during Christmas shopping trips-turned-campaign-stops and baking Welsh cookies for staffers and journalists along for the ride. At one press conference in Florence, South Carolina, she giggled and snuck into a swarm of reporters and tossed the first question to her husband: "What happened to your skinny jeans?" (He awkwardly swiveled away from answering.) She basked in the swelling crowds, even more so when her five sons joined the stump at various stops. She went from politely reminiscing about her brood of "naughty" children to describing in detail a chaotic household that Mitt would return home to and find her, in shambles, trying to piece back together. Over time on the trail, however, it became clear that Romney was much more comfortable taking on a more prominent role in the campaign. Realizing that her ability to connect with voters often hit a spot her husband could not, policy began to trickle into her remarks. "Not only does Mrs. Romney connect with people wherever she goes," writes spokesperson Amanda Henneberg, but, "She is able to show people what a caring and devoted father and husband he is, as well as attest to his strong leadership and his ability to turn this economy around." At a February rally in Rockland, Michigan, she regaled a crowd with stories of her Wolverine State childhood and courtship with Mitt, and then made a marked pivot, striking a newly heated tone. "We are all upset with Washington," she told the crowd of hundreds. "We're really angry about what's going on in Washington. We all balance budgets. We all know how to cut spending in our own personal lives, and we're so frustrated with government, and so frustrated with the debt they're going to leave our children." It was at a pancake breakfast in Moline, Illinois, on March 18, where Ann's political message became even more pointed, specifically targeting women and the economy. "Is there anyone in here that is going to vote for Obama next time? Is there anybody?" she implored of the crowd in the president's home state. "I mean, we're really upset. And I love it that women are upset, too, that women are talking about the economy, I love that. Women are talking about jobs; women are talking about deficit spending. Thank you women! We need you. We all need you in November, too. We have to remember why we're upset and what we've got to do to fix things." Deviating from her usual tales of a houseful of ruffians, Romney's shift to a discussion of the country's "economic house" was a marked change. "We feel as though this is our last chance to get it right. We're going over a cliff - the country is. We've got to get our economic house in order. We have got to stop the spending. We have got to give our children a legacy of something besides debt." Later that day, at a town hall in Vernon Hills, Ill., she expanded beyond just women - but to all Republicans - to stand behind her husband. "At the end of the day, we Republicans are all going to get together and we're going to all unite because we have a community organizer who's going to unite us and his name is Barack Obama," she said, not far from Obama's Chicago headquarters. "So we have some work to do -- we have to have you all get out and vote but we need to send a message that it's time to coalesce, it's time to come together, it's time for us to get behind one candidate and get the job done so that we can move on to the next job, which is bringing us one step closer to defeating Barack Obama." Still though, her remarks that day, while more political in nature, never wholly deviated from her favorite topic of conversation, from the very beginning - her husband. When elaborating on a familiar story of how she and Mitt had first crossed paths when she was in second grade and he was in fourth, she buttoned up her remarks to the Moline crowd by telling them that he used to call out her elementary school bus - Purple Bus Number 7. "I remember him doing that. Unbelievable. From second grade I remember Mitt. And you know what, he's had an impact on my life for a very long time." Now, it seems, her impact cannot go unnoticed either.